“People with monochromatic vision can see no colour at all and their world consists of different shades of grey ranging from black to white, rather like only seeing the world on an old black and white television set. Additionally, the image would usually be very blurry in brighter light (in the brightest light, effectively invisible) but would be less blurry at very low lighting levels.” This is Google on Monochromacy (achromatopsia). Going through the 8 rooms of “Monochrome: Painting in Black and White” makes you experience a fair amount of monochromacy and enjoy the opportunities of a limited colour palette. It is an empathetic point, where the exhibition ends, where it is not possible to see a colour with the naked eye. Going back to the beginning; London’s National Gallery hosts the first large exhibition on black and white painting, which covers some of the finest artworks from seven centuries. It is about “seeing differently”, this phrase as its slogan is on every piece of literature about the exhibition. Looking at black and white opens you up to one other colour (or perhaps I should say ‘sensation’), namely to grey, so many different shades of grey. Looking at black and white makes you notice how interesting grey actually is. Every room in the exhibition is created to present a different aspect of painting in black and white, also known as grisaille. These aspects vary from supporting monastic discipline, making a shift from the colourful earthliness, to very functional intentions such as creating a resource material, to abstraction. It is about looking, but also about being invited to look in a specific way. Ingres’ “Odalisque in Grisaille”, which he made some years after the infamous “Grande Odalisque”, is a central piece of the exhibition. Ingres decided to remake his Odalisque figure and this time left his colours out of the painting. This version has fewer details on textiles; the headscarf or curtains don’t have Eastern patterns on them; the space is less defined. In this dreamy composition, the sense of the skin, smoothness and reality of it is although remarkable here, it is disturbed by the distance in the subject’s expression. This dream-like depiction of a less realistic odalisque perhaps makes the fantasy of “harem” a bit more realistic as a Western artistic phenomenon. Or one could read this painting as a more personal account on the desire the artist had towards this unattainable fantasy. Regardless of what had been taken away from the painting, colours or details of composition, the painting stands as another example of its creator’s mastership and feels like a closer look into his desires. In another example, I see that the artist’s aim had been to create a more sincere representation of their subject and invite us to more of a realistic look, if not to their subject, then to inside their heads. 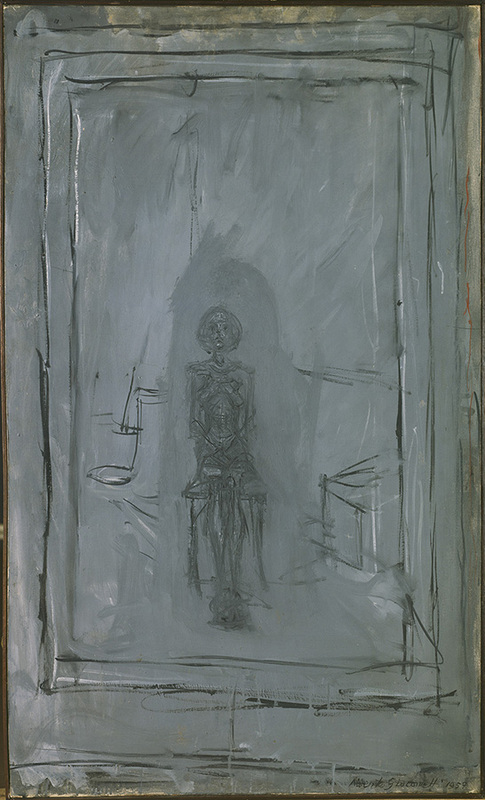 Giacometti’s “Anette Seated” is described as “representing something more universal than an individual likeness; it addresses the entirely subjective nature of seeing and experience”. Giacometti is famously known for his own artistic account of the people around him, expressing his interest in seeing the other’s inner self and painting or sculpting it. The curators of the exhibition Lelia Packer and Jennifer Sliwka mention different reasons for reducing the colour palette, but mainly as a way of focusing the viewers' attention on a particular subject, concept and technique. One room is dedicated to mimicking the appearance of stone sculpture in painting. This could be for decorative reasons, or for understanding how a sculpture would look under different types of light. Titian’s “Portait of a Lady” is an interesting example of this, where he depicts a woman holding a stone bust of herself, the woman and outfit painted in vibrant colours, the bust in black and white. Imitating other techniques, such as print making and engraving, creates works which can have some remarkable illusory effects on the audience. A painting of a print of a painting, “Back from the Market” by Etienne Moulenneuf from 1770, with a broken glass effect, mesmerises and confuses people of our age. The exhibition tells the story of another type of illusion in the last 3 rooms. In the 20th and 21st centuries black and white painting is created in a very radically different environment, which was determined by the free floating mass media imagery. Its relationship with film, photography, broadcasting, public figures, political events has played an important role in painters’ fascination with this new ‘objectivity’, the change of source material and the emergence of abstraction perhaps by deconstruction of the source material. Although the exhibition draws a non-chronological line to follow, but is more based on the intentions or searches of the artists in using no colours, this line finds a chronological logic towards the end of the exhibition. We end up in a warm orange lit room, ‘walking to the light’ as near death experienced people would describe it, unable not to walk to the light with some hunger for colour. This room has Olafur Eliasson’s “Room for one colour”, and as we walk in we appear to be made up of different shades of grey. In this exhibition I read so much about the humaneness of the creators of the works shown. Although some initially may have wanted to show off their techniques, the whole show tells me about the artists representing non-ideal, but more personal versions of the world as they see and experience it. When the colours are stripped, is there more to see about the challenges of artists, their desires, their aspirations, their fantasies, their ways of protest or their proposed narrative for a new world? Losing all the colours I had on me and around me in the Eliasson room made me feel empathetic, as if I became a subject in one of the works I had just seen. Finally everything and everyone we see turn into shades of grey and makes us achromatopsiacs for the time being. An ingenious ending to this very concise, not at all boring show... It is surprising, and it is certainly fun. Still, it was a relief to walk outside of the room, melting into a beautiful and colourful autumn day in London, knowing that I had witnessed a version of self with no colour at all and it was fine. The exhibition can be seen in the National Gallery, Sainsbury Wing until 18 February 2018. And here is a further reading: The Island of the Colorblind by Oliver Sacks, if not the beautiful exhibition book.